Eartec 308, 308D, 510 and 510D are lightweight, budget headsets offering users a comfortable, flexible and great value headset solution. There are four different models in the range offering a monaural or binaural solution as well as a choice between flex or easy flex boom depending on your working environment and personal preference. The range is fully compatible with a wide range of IP deskphones and DECT handsets, by simply choosing the correct bottom cable. 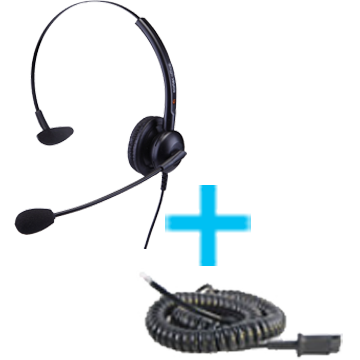 See our headset compatibility guide to find out which cable you require. Because the headsets have quick disconnect (QD) functionality it enables them to be used across multiple devices, even if the devices have different connection types.